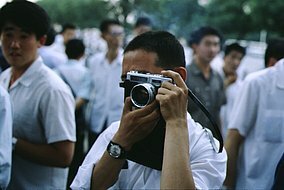 Most of the photos on the following pages have been taken by Helmut Opletal during his stays in China between 1979 and 1984. Others (especially in the introductory part) have - over the years - been made available from private archives by other observers or participants of the Democracy Movement. Special thanks for providing photos and/or other documentary material is extended to Chen Ziming, Nancy Hearst (H.C. Fung Library/Harvard University), Hu Ping, Huang Rui, Martin Krott, Li Shuang, Ma Desheng, Jacqueline Nivard, Alain Peyraube, Wang Keping, Xu Wenli, Yan Li, Friedrich Zettl and the Universities Service Centre at the Chinese University of Hong Kong. A very few photos though could not be traced back to their sources, for indications about original photographers and copyright, please contact the author.